This story marks the first of six blog stories spotlighting New Jersey’s shark species – and educating people about why shark populations are in danger throughout the world. CONSERVE WILDLIFE FOUNDATION IS INITIATING CONSERVATION EFFORTS DIRECTED AT THE SHARKS, RAYS, AND SKATES WHICH OCCUR IN NEW JERSEY WATERS. Sharks, rays, and skates are cartilaginous fish within the subclass Elasmobranchii. Elasmobranchs predate the dinosaurs by hundreds of millions years, having first appeared in the fossil record during the Devonian Period approximately 400 million years ago. They are a very diverse group, with over 350 species of sharks and over 500 species of rays and skates currently existing worldwide. A sand tiger shark. Photo courtesy of Gerald Walters & Jenkinson’s Aquarium. Sharks and rays are highly specialized and occupy a wide variety of habitats. Some species are slow-moving bottom feeders which prey on crustaceans while others are fast-swimming predators of marine mammals. Many shark and ray species are apex predators, at the top of many food chains. They play a critical function within the marine (and occasionally freshwater) ecosystem preying on the weak, sick, or injured and maintaining a balance within their environment. Sharks and rays are frequently misunderstood and feared as a result. Sharks have been portrayed in movies as man-eating monsters which target humans as a meal. Rays are also feared due to their appearance and because many species do, in fact, carry defensive barbs on their tail which have been known to injure or even kill people. Because of their bad reputation, sharks are often targeted by recreational fishermen as trophy catches. However, the greatest threat to sharks and rays comes from commercial fishing for several reasons: (1) directed fishing for sharks, especially for their fins; (2) capture as bycatch during other fishing activities; and (3) overfishing of prey species. Degradation of habitat is another threat to sharks and rays. Many species give birth within inshore coastal waters and those same areas are a nursery for the young. Pollution and/or development of those areas represent a threat to those species during a critical stage of their life. Climate change and its impact on food resources of sharks and rays is another potential major threat to sharks and rays which is poorly understood at this time. Due to the biology of sharks and rays, these many threats are worsened by the fact that fewer individuals are replaced than are killed. Sharks and rays are generally long-lived species which don’t reach sexual maturity often until they’re in their teens or older. Then, they may give birth to as few as two young every two or three years. 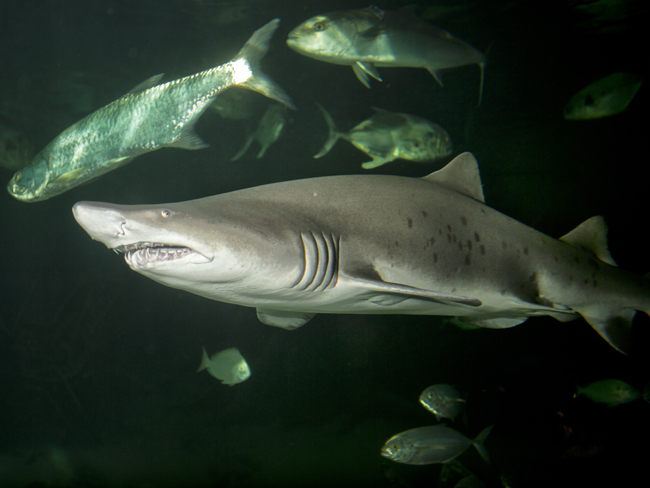 Follow our blog posts throughout the week to learn more about some of the shark species which occur in New Jersey waters. This entry was posted on Sunday, June 26th, 2016 at 8:34 am	and is filed under Fish, Marine, Wildlife Protection. You can follow any responses to this entry through the RSS 2.0 feed. Both comments and pings are currently closed.